Shaindel Beers’ first collection, A Brief History of Time, opens with the title poem, which is an ars poetica. Beers writes, “I’ve decided to change / history, by writing these untruths.” Beers revisits and reshapes the physical and emotional terrain of her youth. This first poem introduces us to many of the overarching images and themes contained in this collection. The second poem asks, leading with the title, “Would you know me / if you had met me in my natural environs / wearing the uniform / of the hardworking rural poor.” The speaker of this poem feels she wears a mask. She goes on to describe that uniform and then compares it to her “favorite disguise – sophisticated city-dweller.” This speaker is a displaced person, an individual who does not yet feel at home with the past or the present. She is still looking for how she fits into the geography of her own history and future. There is a danger with poems like “First Love,” that are so harsh in their reality because I find myself questioning whether or not they are ‘believable.’ Sometimes what really happened isn’t always the ‘truth’ in that experience. Sometimes what really happened is almost too much for a reader. Beers’ ability in the end, however, to couch these events in visceral visuals and strong word choices keeps me reading. “Body Shop” is an excellent example of Beers’ skill. In “Body Shop,” Beers takes the debris of a hard life and turns it into poetry. The poem opens with, “I’ve promised parts to men” and it continues with robust images such as “pale blue moons” and “pearls on a tray.” By the end of the poem, the speaker has taken ownership of her body as she removes her own breast and serves “it up / all raspberry silk on a silver platter.” This speaker is fighting for her identity as a woman, a lover, an equal. It is refreshing that Beers takes car imagery, which is usually masculine, in this poem and throughout the collection to assert her identity. “Body Shop” is a strong poem from start to finish. There are some poems in this collection, however, where the endings seem too quiet. “Red Heifer”, for example, opens with, “That was the year of the all-black cattle, / except for the small, red heifer / I wanted to be mine.” A red heifer is a very iconic image especially in Jewish literature. This poem progresses through the life of the heifer and the speaker until it closes where the speaker can no longer remember the name of the calf but recalls the first time she saw it and how it, “took away my pain / when Grandpa yanked my Band-aid off, / pointing to her across the field / as a distraction.” I had a hard time comparing the pain of band-aid removal to the apocalyptic/messianic image of the red heifer. But, even with my concern over the ending it is still a fascinating poem. One of my favorite poems is “My Love, A Partial Explanation.” It is in this poem that Beers shines. She takes images that have appeared throughout the book, unexpected bits not just of history/time but of other sciences and pop culture, and melds them into fantastic lines such as, “when we talked our odd talk about relationships / and the stars; no really astrology, / more astrodynamics and Eagles’ lyrics with a bit / of quantum theory thrown in for good measure.” The universe of this poem, of this book, lives in that type of sentence where the poet is taking everything around her and processes it into something new. Perhaps the only thing lacking, for me, in this collection is an ultimate declaration of self. I found myself wanting a sense of closure, but Beers knows we are never closed individuals; we are never just one thing, one face. The speaker of these poems is still a work in progress. I can identify with the speaker of these poems even though we do not share the same life story. This, to me, is the sign of a successful book. 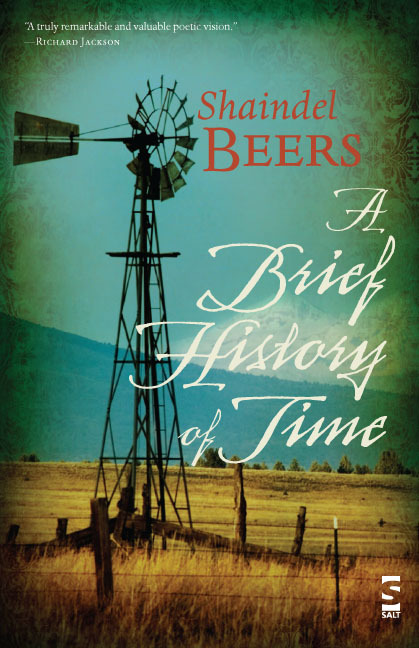 With A Brief History of Time, Beers puts together a collection of what some might call juvenilia, or what I prefer to say are poems that examine the landscape of youth, that do not come across as maudlin or pity-though-me. Beers does not over sentimentalize or play the victim in these poems, which is a huge accomplishment. I look forward to what topics Shaindel Beers turns her keen eye towards in the future. Jessie Carty‘s writing has appeared in journals such as The Main Street Rag, Iodine Poetry Journal and The Houston Literary Review. The author of two chapbooks, her first full length collection, Paper House, is now available from Folded Word Press. Jessie is also a photographer for and editor of Referential Magazine. You can find her around the web but most often blogging about anything from housework to the act of blogging itself at http://jessiecarty.com.